Yet the Galileans welcomed [Jesus], for they had been in Jerusalem at the Passover celebration and had seen everything he did there. As he traveled through Galilee, he came to Cana, where he had turned the water into wine. There was a government official in nearby Capernaum whose son was very sick. When he heard that Jesus had come from Judea to Galilee, he went and begged Jesus to come to Capernaum to heal his son, who was about to die. There were many reasons for people to seek out Jesus. Some were enthralled with him as a great teacher. Others were just fascinated by him as a miracle worker. Some wanted to find out what all the fuss was about. However, some found themselves in situations too big and too grave to master by themselves. They knew they needed a Savior. Here was a powerful government official made powerless when it came to his deep concern for the well-being of his son. He came to Jesus for help that only Jesus could provide. He wasn't ashamed to beg. 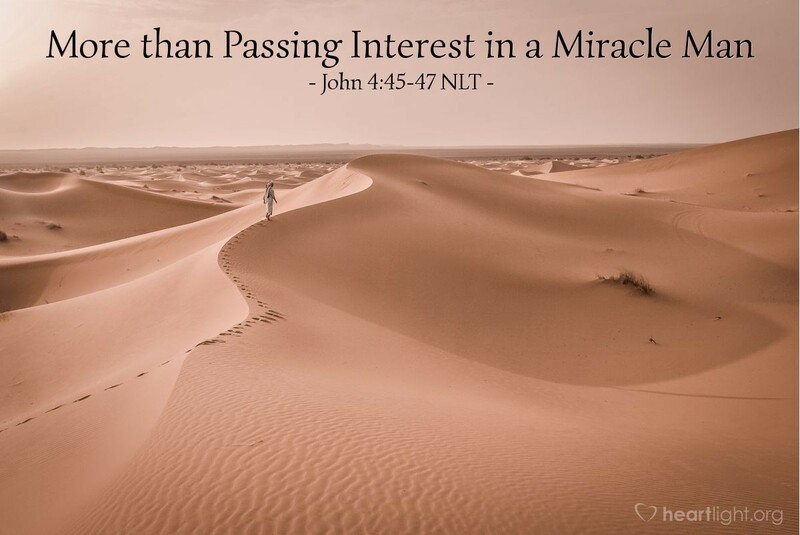 He wasn't hesitant about inviting Jesus to his home (John 4:49-50). Only Jesus could help, and he knew it. What about you? Do you find yourself in a situation too big for you to master? Then why not call on Jesus to return and be your Master? Father, I confess that I sometimes remove myself from dependency upon your power and grace. I often get so caught up in all the things I think I can do on my own that I quit depending on you to sustain me. Now in this moment, I freely confess that I cannot control the things that matter most in my life. I ask for your mercy, help, and grace. I ask that Jesus will come into my life and mend what is broken, strengthen what is weak, and pick up what is fallen. Without your grace and the Savior's powerful presence, I will surely fail. In the mighty name of Jesus, I ask for this grace. Amen.